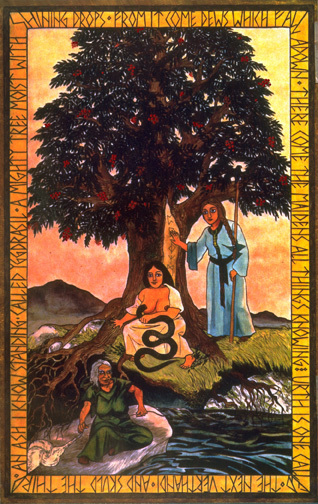 The Völuspá ("Sibyl's Prophecy") is one of the oldest sagas of the Icelandic Edda. A seeress sings of the all-knowing Fates living under a great Tree beside an ever-living Well. "Urd is one called, Verthandi the next, and Skuld, the third. They mark on the wood, they ordain laws, they allot lives for human children, speaking their fates." Urd means "became," Verthandi "becoming," and Skuld, "shall be." Their names come from a very ancient Indo-European root meaning "to turn, to spin, to become. " To use credit cards, look below the Paypal info on the Buy page.